Sometimes there is a big difference between what you see and what you get. 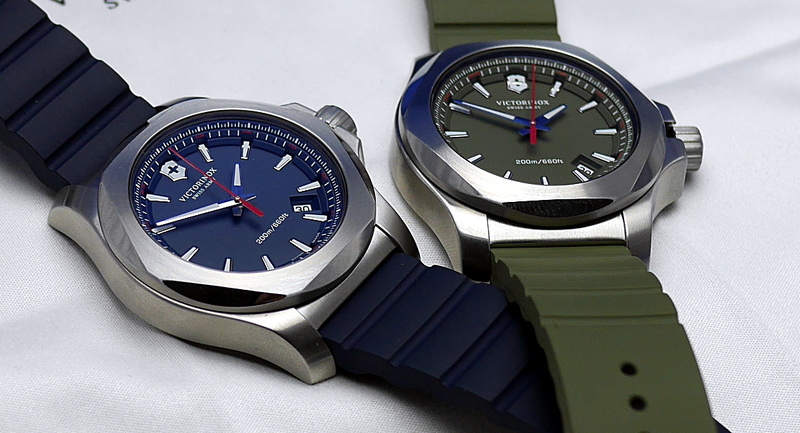 That’s what happened at Baselworld 2014, when I first saw the Victorinox INOX . A name which is concise and incisive at the same time. Victorinox already proved what it is capable of making in its high-tech diver, the Dive master 500 . The Victorinox INOX is something completely different; it stands out for its sleek, neat, and finely done design, as we would expect from the brand. The dial is elegant, minimalistic, monochrome, and perfectly fits the round case which has the bezel chamfered in the shape of a hexagon. If you just focus on its design, though, you may think this is just a nice three hands timepiece. If you read through the tech sheet, instead, you realize you are looking at a small fortress that can easily be wrapped around a marine’s wrist. Because the Victorinox INOX ‘s soul is all about extreme robustness. Before now I think nobody has been able to create a wristwatch which can withstand stress such as: falling on cement from a 10mt height, a weight of 8 tons, a desert storm, changing temperature between -51°C and +71°C, an acceleration up to 12g, and, last but not least, contact with several chemical solvents. The strengthened stainless steel case is 43mm wide. The dial is one-piece, the indexes are not attached to it but rather engraved on it, and then filled with luminous material. The hands’ shaft and fastening have been strengthened, and an additional rubber and nylon cover is also provided. The calibre, which has to resist all these shocks, is a swiss quartz movement, precisely a Ronda 715 . If I think about the 130 tests the INOX has undergone, what amazes me the most is the excellent price to quality ratio, which is about 500$ (we still do not know the price tag in euro but expect it to be similar). It is made in three different colors, all supporting a cautchouc bracelet. As an evolution to this timepiece, I’d like to see the quartz caliber be replaced with a mechanical one in the near future.